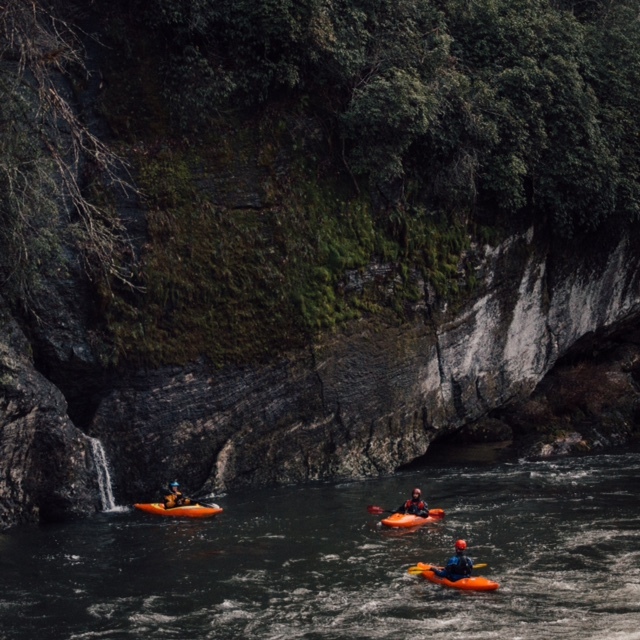 The lower sections of the Chattooga have long been a southeastern classic, but the upper reaches were closed to kayaking until advocacy work by American Whitewater brought the Forest Service to change its policy. Access is still heavily restricted and tenuous, so please pay attention to the rules and treat this place with the respect it deserves. The US Forest Service regulates the Chatooga corridor. They do not specify gear requirements beyond the basics (PFD’s, helmets). The permit is free, and self-registration stations are located at the put in for each section. Every group is required to have a permit. Groups must be between two and six boaters. Recommended gear includes everything that a group would take on a class V trip including a breakdown paddle for every two boaters, group first aid kit and group pin kit. 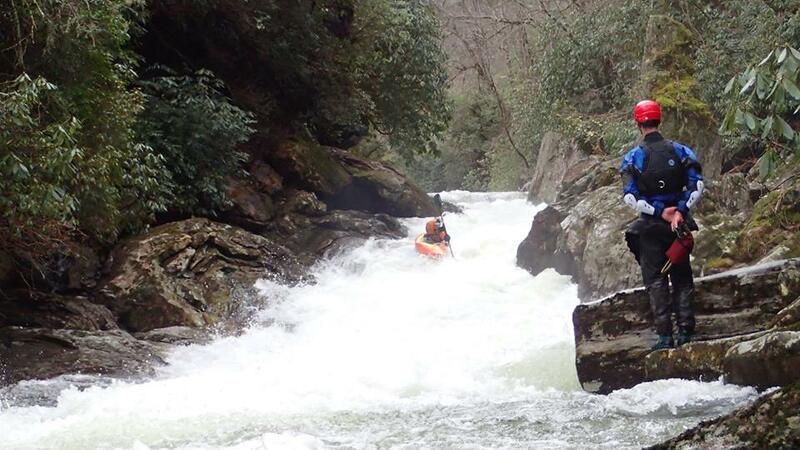 Due to the season that the Chattooga is open for paddling, winter camping gear is recommended. Caleb Paquette in Super Corkscrew, photo by David Cohen. Camping is allowed anywhere in the river corridor except where specifically banned by signage. Camp spots must be ¼ mile from the nearest road and 50 feet from the river. The soil in the Southeast is full of microbes and highly active. Human waste can be buried in a hole at least six inches deep. Every group should bring a trowel. 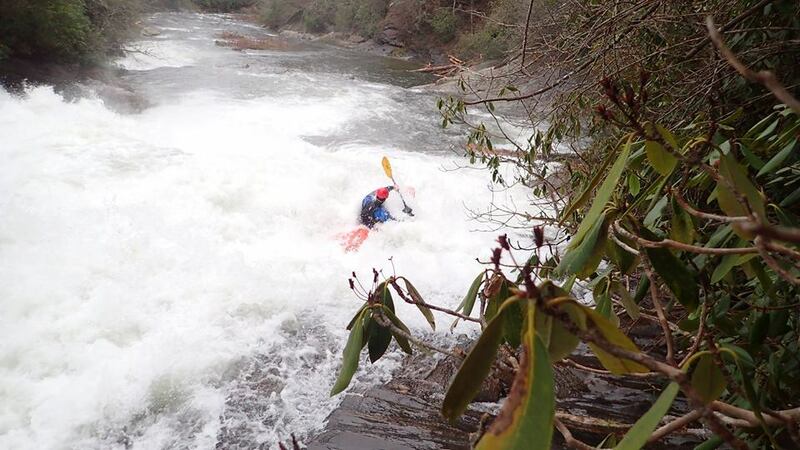 Caleb Paquette at No Kayaks, a rapid on Section 00. Photo by David Cohen. The Chattooga overnighter is a high yield trip in terms of logistics. The shuttle is a little over an hour one way and yields two to three days on the river. Chattooga River Resort and Campground can help with shuttles. There is a pesky four mile section of class I that is illegal for kayaking (Licklog Creek to Highway 28) about 20 miles into the run. It will be encountered at the end of the first day on the water. Navigating this obstacle requires a little ingenuity, help with shuttle, or pure grit (a four mile portage on the Chattooga River Trail is one option). To each their own. To reach the put-in, park at the trailhead and go about 3/4 of a mile on the Chattooga trail. Look for the Green Creek trail on your left and follow that down to the river. The American Whitewater page has a little more detail on the hike. Look for at least 500 cfs on the Burrells Ford gauge to put on at the top (Section 00). 700 cfs is preferable and most people would hesitate to put on above 900 cfs, although it has been done as high as 1500 cfs. If the river is between 350-500 starting at Section 0 or Section 1 is a better option. Paddling is not allowed by the USFS when the river is below 350 cfs. When the upper reaches are running, the lower sections of the Chatooga are big. 700 on Section 00 translated to a little over three feet on the US 76 bridge gauge for our trip. Sections 2 and 3 are enjoyable, big water class III and Section 4 is pushy class V from Woodall Shoals to Lake Tugaloo. The crew reveling in the Narrows of Section 3. Photo by Cooper Lambla. This fifty mile trip can be done in two arduous days but it is more enjoyable as a two night, three day trip. If done in two days you either car camp near the lake or get home in the wee hours of the night, so why not spend another night on the river? Sections 00, 0 and 1 take six to eight hours. The hike in takes about 30 minutes, but it feels longer with a loaded boat. 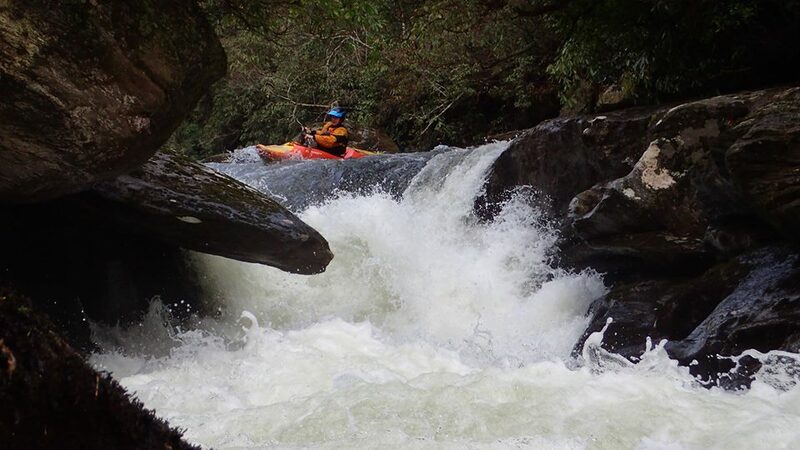 The Chattooga is a humble, quaint stream at the top but it quickly develops a personality with sheer walled mini-gorges, involved portaging and classic whitewater. Section 00 is similar in difficulty to the Green or Overflow. Section 0 has an intimidating Raven Fork-esque drop at Super Corkscrew. Section 1 feels like a real river, particularly in the Rock Gorge, which contains a half dozen class IV/V drops back to back. Adam Herzog at Big Bend Falls, Section 1. Photo David Cohen. Camping is ample at the top of Section 2. Hold out for a good spot because they are everywhere. Three day groups can sleep in, cook a leisurely breakfast, and relax before setting off on one of the best high water float trips in the Southeast. The miles tick by fast and the whitewater is a nice mix of class I-III. Don’t let your guard down too much though because soon you will find yourself routing into a beefy Bull Sluice. We left a beer stash at the US 76 bridge during our shuttle drive. We stopped on our paddle down and filled our boats with microbrews before roaring into Section 4 at proper flows where big waves and big moves abound. There is a world class campsite on river right above the Five Falls. Enjoy your stashed brews and savor another night under the stars before a class V breakfast of high water Five Falls. This article was contributed to CampingByKayak.com by Adam Herzog. The cover photo is Adam in Super Corkscrew on Section 0 contributed by Cooper Lambla. ← Weight, Food, and Just How Much Beer Can I Bring Anyway?